This page gives a sample of Dr. Velegol's books, scientific publications, courses, and white papers. Learning, discovery, and writing about this content shapes KPCo's philosophy in a big way! The book "Colloidal Systems" (2016) lays out the fundamentals for this amazing field. Learn the basics of colloidal forces, colloidal stability, hydrodynamics, electrokinetics, synthesis, and more. The book "Wild Scholars" (2011) gives Dr. Velegol's philosophy for education. Immersion experience, value-based ventures, great coaches. It's all here. The book "CENTER" (2013) systems 6 principles for imagining great dreams and winning great victories. CENTER = Character + Expertise + owNership + Tenacity + Enterprise + Relationship. The book "Physics of Community" (2014) lays out the new science of "chemical game theory" (CGT). CGT examines contested decision making, political power dynamics, and what happens when these collide! Natural products like the seed from the Moringa oleifera tree can be used in powerful ways. Here Moringa-coated sand is used to kill bacteria (red), compared with live bacteria (green) on uncoated sand. Permission from Jerri et al, "Antimicrobial Sand via Adsorption of Cationic Moringa oleifera Protein," Langmuir, 28, 2262–2268 (2012). This is a great example of "chemically-driven transport" (CDT). We know about pressure-driven flow, and even electrically-driven transport (eg electrophoresis). CDT opens new opportunities! Micropumps," Langmuir, 28, 15491−15497 (2012). Our calculations show that for Van der Waals forces between nanoparticles, 2-body interactions are not always enough -- sometimes you need >5-body calcs. Permission from Kim et al, "van der Waals forces between nanoclusters: Importance of many-body effects," J Chemical Physics, 124, 074504 (2006). You can't pump fluid in a pore that is closed off -- a "dead end pore". But you can use chemically-driven transport to cause flow. Here, oil drops come out, and particles go in. of Dead-End Pores," ACS Nano, 9, 746-753 (2015). In 2013 I co-taught a Massive Open Online Course (MOOC) in "Creativity, Innovation, and Change". I had the privilege to spend a LOT of time with two amazing co-teachers and friends, Professor Jack Matson and Professor Kathryn Jablokow. This MOOC gives fundamental principles with this core idea: Creativity CAN be learned! Three axes of expertise required for innovation. 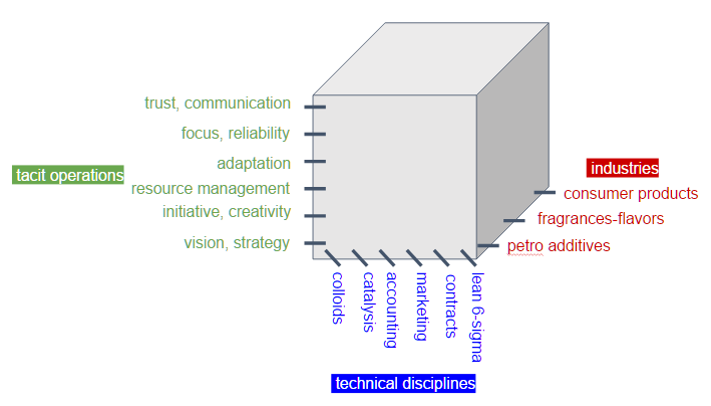 Companies know their industry, and their teams collectively know the technical disciplines. Team members “should know” the tacit skills -- the “fundamentals” of commitment, initiative, creativity, reliability, adaptivity, focus, trust, communication, and the others. KPCo grows innovation by addressing all three axes. In our experience, the “tacit operations” are the limiting factor, and so we ruthlessly use fundamentals to coach and execute in these areas “that we all should know”, to make innovation go! Some of Darrell Velegol's "top shelf books"
Chernow, “Washington” (biography about George Washington).